Microform, Video and Electronic Media Librarianship focuses on techniques, measures, and processes in librarianship. The book first discusses librarianship, microforms and microform librarianship, non-book media in libraries, and history of microforms. The text also looks at the place of microforms in libraries. User reaction to microforms; economic advantages of microform acquisitions; and contrast, resolution, and density of microforms are discussed. The book also discusses micropublishing. Changes in publishing methods, abstracting and indexing services, bibliographical services, archives, synoptic journals, and government reports are described. The text underscores library catalogues. British National Bibliography; Scottish Libraries Co-operative Automation Project (SCOLCAP); South West Academic Libraries Co-operative Automation Project (SWALCAP); and benefits of computer-based cataloguing systems are discussed. The book also looks at data services, copyright laws, relationship of information technology and libraries, and archival potential of non-book media. 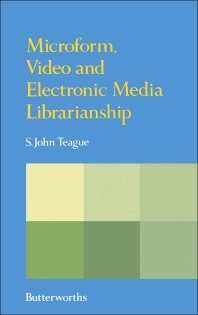 The text is a good reference for readers interested in librarianship. A New UK Copyright Act?